1. I post like 17 Blog post today. I am finally feeling better and I do what I want. 2. It is almost this coming weekend and I am still crafting my weekend recap of last weekend :) I had a great time and purposefully took pictures with the intention of blogging. So it may be late but it will happen.. so just read it. 5. I have made it through this sickness by surviving on BC power, Z-Pack, Strawberry-Watermelon Gatorade, and Strawberry flavored fruit snacks. 6. I have missed the last two days of work and I know that there is crap stacked up waiting for my return... ugh! 7. I leave for NYC next Friday, who needs to pack or wash clean clothes. 8. My trainer has texted me the boxing schedule twice this week..does he not realize I was at deaths door step the last few days?! I mean seriously. 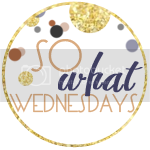 I love this weekly link with up Shannon over at Life After I Dew, it is one of my favorite blogs to stalk follow. You should definitely head over if you haven't already! So what are you saying so what to?? haha! gotta love a persistent trainer. that's why they get paid the big bucks!